Alberta Election Results 2012: What Went Wrong For The Wildrose? HIGH RIVER, Alta. 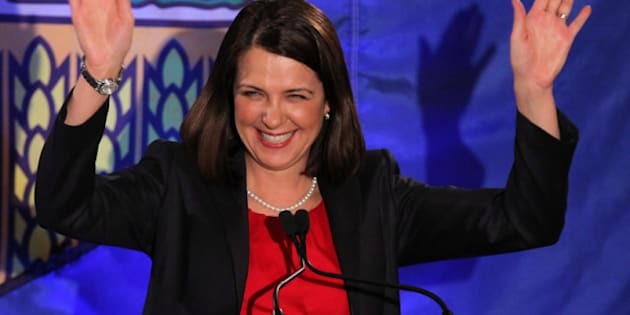 - Danielle Smith says Albertans decided the Wildrose wasn't ready to lead the province just yet, thinking twice after the party suffered some "self-inflicted wounds" in the dying days of the campaign. But she's betting voters will be ready when they go to the polls again in 2016. "I think we were asking Albertans to take a pretty big step and make a pretty big choice to turn down a 41-year government and try something new, and we weren't able to convince everybody that now was the time," Smith told reporters after going down in defeat to Progressive Conservative Premier Alison Redford. "We're just looking forward to regrouping and looking at 2016 as a time to be able to defeat this government." Polls leading up to Monday's vote seemed to point to a Wildrose majority government. It would have been the first change in government since Peter Lougheed's Progressive Conservatives swept to power 41 years ago. The mood was mixed amongst supporters in Smith's Highwood riding south of Calgary before polls closed. An ebullient Scot Lane said he was "100 per cent" sure of a Wildrose win. "It's going to be a victory celebration, so we're all excited about that for sure." But Alan Weenink wasn't so sure, describing his attitude as "cautiously optimistic." "It's going to be close." Speaking to supporters, Smith said her party expected to do better, but she wasn't giving up. "Am I surprised? Am I disappointed? Yeah. Am I discouraged? Not a chance," she said. The Wildrose began the campaign in a strong position, with its Progressive Conservative opponents on the defensive as they dealt with a string of controversies. The first week saw the Wildrose make its "Dani-dollar" pledge, promising to cut a cheque to every man, woman, and child, when energy revenues create a budget surplus — $300 in 2015 if things went according to plan. But fears that the Wildrose holds hard-line views on thorny social issues began to emerge in the second week of the campaign. About 10 days in, so-called conscience rights emerged as an issue. Smith wouldn't say whether she supported allowing public workers to opt out of tasks, such as marrying gay couples or prescribing birth control, because of moral objections. She said her party would set up a court system to handle complaints when they arise. A few days later, Smith took flak for refusing to completely rule out whether citizen-initiated referendums could be used to delist the public funding for abortions. Smith sought to defuse some of the controversy by stating at a candidates' forum that she is pro-choice and pro-gay marriage, and that her party does not intend to legislate on moral issues. But the socially conservative perception wasn't going away. In the third week, an anti-gay blog post by candidate Allan Hunsperger came to light. Then comments from another candidate drew fire. Wildrose Calgary candidate Ron Leech told a radio show that, as a Caucasian man, he speaks to the whole community rather than just members of his own ethnic group. He later apologized. Mayors of Edmonton and Calgary — Alberta's two biggest cities and home to scores of tightly contested seats — criticized those candidates' comments. Smith, meanwhile, staunchly stood behind both Hunsperger and Leech. The leader stoked more controversy by questioning the widely accepted scientific theory that human activity causes global warming, saying that the "science isn't settled." Smith admitted to reporters that her party suffered some "self-inflicted wounds" toward the end of the campaign. "And maybe that was enough to make people pause and say 'hmmm...maybe this group needs a little more seasoning.' I take that seriously. I know that we do have to do a little more work to be able to earn the trust of Albertans." Strategic voting also played a role, she said. "I think that it's pretty clear that if you look at the Liberal and the NDP turnout, (Redford) managed to convince people who traditionally vote for the Liberals and the NDs to vote for her party." Jim Smith, a supporter at Wildrose headquarters, said he was "shocked" by the results and that he had been expecting a Wildrose majority government. But he said the party made a few mistakes. "It's too bad we didn't make our mistakes in the first round (instead of) at the end," he said. "I think the two candidates (Hunsperger and Leech) that came out with some bizarre personal opinions — that hurt us." Smith said she wouldn't do a single thing differently. "I wanted to wake up the day after election day, feeling like there was not one more thing I could have done to win one more vote, and that is exactly how I'm going to feel. "I'm pretty excited about the crew that is going to the legislature and I think we're going to do a terrific job doing what Albertans expect us to do — holding this government to account as official opposition."